Prince George, B.C. 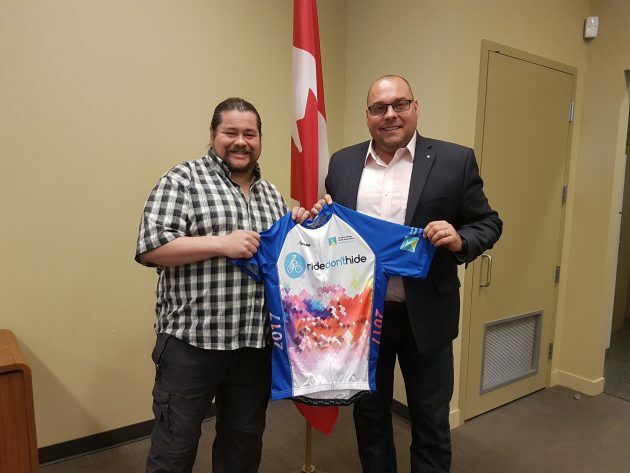 – The Ride Don’t Hide fundraising campaign is over for this year, but the fight to assist those with mental health issues continues. This morning, the Canadian Mental Health Association, Prince George Branch, presented a special Ride Don’t Hide bicyclist shirt to Cariboo Prince George MP Todd Doherty. Mary Lu Spagrud, Manager of Education and Projects at the CMHA Prince George Branch praised Doherty for his efforts to bring attention and help to those who are suffering with PTSD and other mental health issues. The date for the 2018 Ride Don’t Hide event has been set. It will take place on June 24th. Registration for the event will be open in a couple of weeks. Well, Rob Gagnon is now in the Fraser valley after having left PG a few weeks ago and walking to the legislature in Victoria. Doing it for PTSD FIrst Responders. He has had a multitude of people walking with him, donating money to the campaign and generally bringing awareness to this. And now Todd says they lost 3 more! Sad cases that effect the families involved. Give ‘er crap Rob!! !